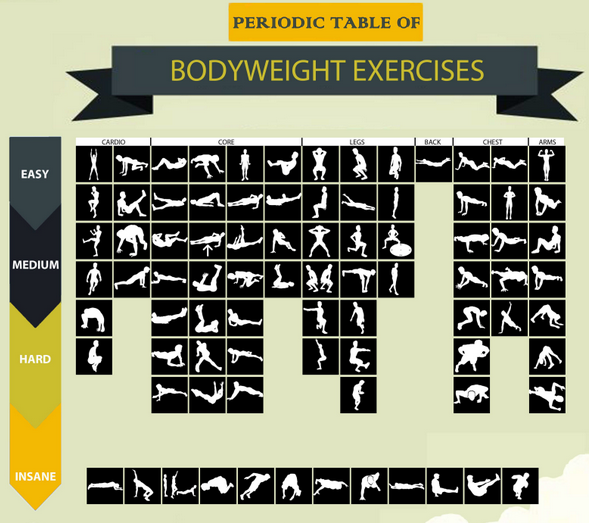 Periodic table of bodyweight exercises, find it here. I’m finally working on a 6-7 day a week workout cycle. I’d had ambitions to experiment with 100 days straight doing something, but quickly realized that was an amusingly dumb idea. I need to find a certain kind of pace and balance before I murder myself that way. I sometimes like exhausting 90 minute cardio and strength something or others, and no way in hell I can do that for 6 days straight. I may be near that, I don’t know. I mean, I’m in good shape but I’m also still kind of old and fat, so, you know, caveats apply. Today I did do something that was a little different for me and it felt like a pretty (here’s that b-word again) balanced thing to do. If I’m doing a circuit of bodyweight or kettlebell exercises I normally plan them out informally ahead of time, either off the top of my head or based on something I’ve seen on sites I visit, like 12 Minute Athlete or FitnessBlender. I write out what I plan to do, set my phone’s stopwatch and get busy. Today, rather than focus on reps, I decided to set the timer for 20 minutes then see what I could get done during that time, stopping when the timer buzzed no matter where I was. This wasn’t intended to be any kind of major workout–because I might lose motivation tomorrow if I slammed it today. Like I said, I’m old. Two-handed swings with a 53-lb kettlbell-12, 12, 12, 10, 10. This ended up being a faster-paced workout than I sometimes do. I was sweating like a pig who just heard the farmer’s wife complaining she’s out of bacon. I think I could up the speed a good deal in the future and add sets. It hit most everything, though, and I don’t feel like completely flopping for the rest of the night. I really want to avoid that when I do choose to write about fitness. If many of the people who take on that sort of authorial tone (honestly, this also applies to a lot of Youtube videos about working out–hell, maybe most of them) truly cared about helping others learn about the benefits of fitness, they’d be way more inviting and accommodating. Maybe shaming a person struggling with their weight and appearance will work for a time, and maybe it’s exactly what some people think they deserve, but it never worked for me, and I’m sure I’m not alone in that. I’ll do my best to not link that sort of thing, save for amusement value.